Federal and South Dakota laws require employers to post notices informing employees of their rights and protections while performing work for their employers. 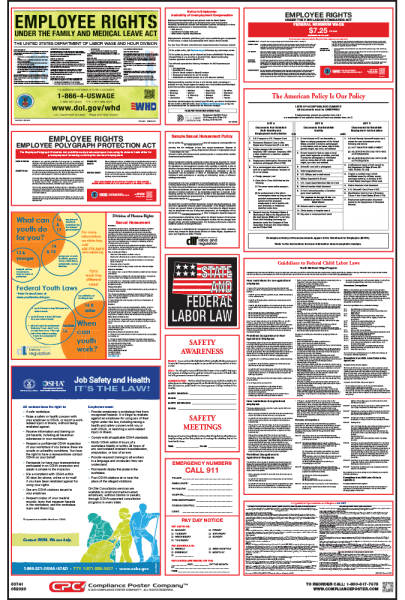 South Dakota Labor Law Posters contain each of the state and federal mandatory labor law notices that must be posted in the workplace. In South Dakota, employers may also be required to post a separate city or county poster depending on their location. When multiple posting updates are released at the same time, the most economical way to achieve posting compliance is to fully replace the All-On-One™ Labor Law Poster with the updated version. When only one posting is updated, you can instantly update your existing All-On-One™ Labor Law Poster with CPC’s innovative Peel ‘N Post™ update. A Peel ‘N Post™ is an adhesive-backed posting that sticks over the outdated posting on the All-On-One™ Labor Law Poster. All-On-One™ Labor Law Posters are updated with each mandatory and minor change as they happen, so purchasing a new poster is always an option. CPC tracks proposed laws and regulations all year long so that you can be prepared for new laws that may affect your workplace and posting obligations. OSHA: Job Safety and Health. It’s the Law!